Saturday 19 November passed peacefully – perhaps because the President appointed a ‘Prime Minister’ 3 days earlier. It seems though, the date everyone is anticipating is 19 December. Most ex-pat NGOs and non-essential UN staff are being told to leave DRC by 15 December. There is not only the youth movement who post anti-government twitter-feeds regularly – but now also a movement called “Bye-bye Kabila”, who are calling for a peaceful protest march on Friday 25 November. 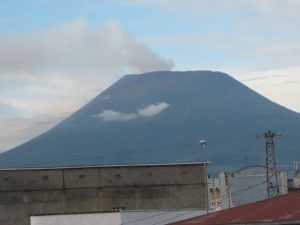 We have not been aware of any related anti-government incidents in Goma though there have been a couple of incidents of lawlessness. 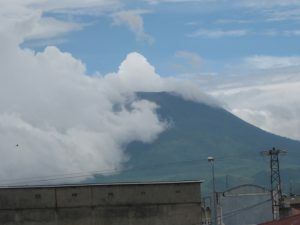 Mt Nyiragongo volcano, overlooking Goma, continues to please photographers with its array of cloud formations – and keeps on smoking from its crater!! Some of you will have read this on Neil’s Facebook post, but for those of you who do not follow Facebook……the following is Neil’s account of one ‘Diverse Day’……. The patient with the gun-shot wound did well following surgery. We were hopeful of a full recovery….. unfortunately, when we arrived in Mombasa later in the month we received news that he had died after we left. The inaugural meeting of the HATS Management Team was held on Monday 21 November, presided over by the Dean of HATS, Dr Luc Malemo. Ten departmental heads of various training programs at HAH were informed of the renewed emphasis being given to ‘training’ within the organization. Teaching and Training in all HAH services and departments will lift the standards of the organization and contribute towards improved healthcare at the hospital and the community services it provides. 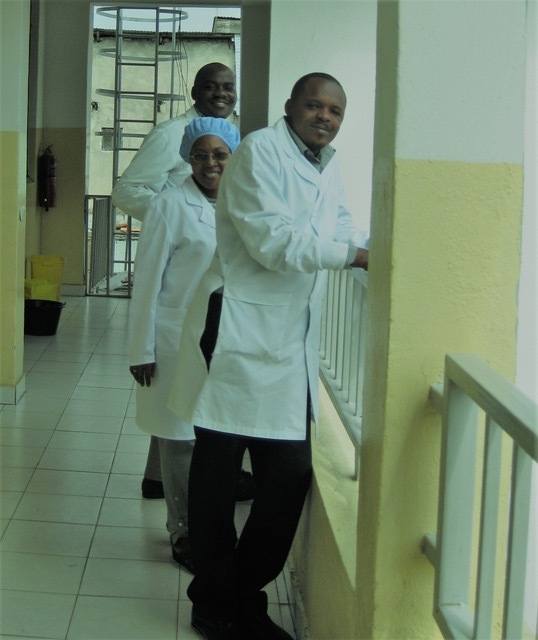 HAH Dentist, Siva, who has been mentored and trained by AusHEAL team dentist, Dr John Yared, spent 18 days at the large dental unit at Kijabe Hospital in Kenya. He was sponsored by an AusHEAL Short-Term Development Grant. Siva was able to observe how work was organized and performed in Kijabi, as well as learning about root canal treatment and the use of dental braces. Following discussions with the Chiefs of Nursing about selection of suitable nurses to receive an AusHEAL Short Term Development Grant (STDG), Orthopaedic Officer, Katembo, who works in the operating theatre, was awarded a grant to visit a Nairobi hospital to observe and learn the necessary skills for new procedures now being undertaken at HAH (knee and hip replacements). Tests & interviews were conducted for the 5 College Trainees at HAH to assess their progress with the COSECSA Membership Training Course. Lack of proficiency in English is a major hurdle contributing to difficulties in comprehending the clinical texts they are studying. They are showing good improvement in this area. All agreed the training program was quite heavy, but realised the opportunity they have been given. The trainees reported learning many new things with resultant improvement in the care and management of their patients. All 5 are keen to continue. This week, the 5 COSECSA Trainees and 4 of the HAH Trainers are in Mombasa, Kenya (together with Dr Jo Lusi, founder of HEAL Africa) attending the COSECSA Annual Scientific Conference. 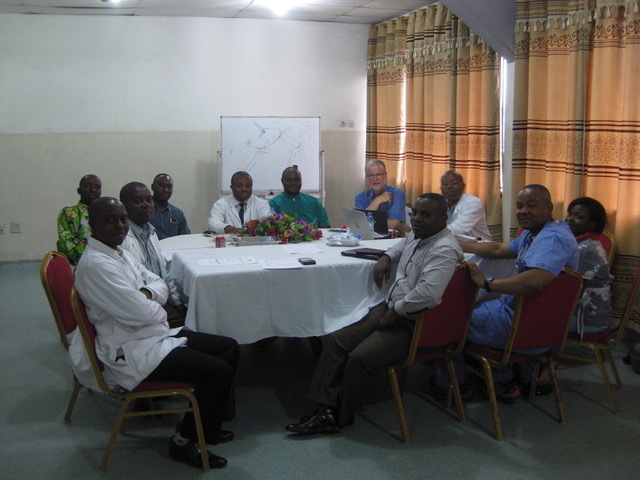 Not only is it beneficial for the HAH doctors to be exposed to a wider experience of surgery in Africa and attend the scientific presentations, but equally important for the COSECSA College to witness the enthusiasm and commitment of the first Membership Training Program established in D R Congo. 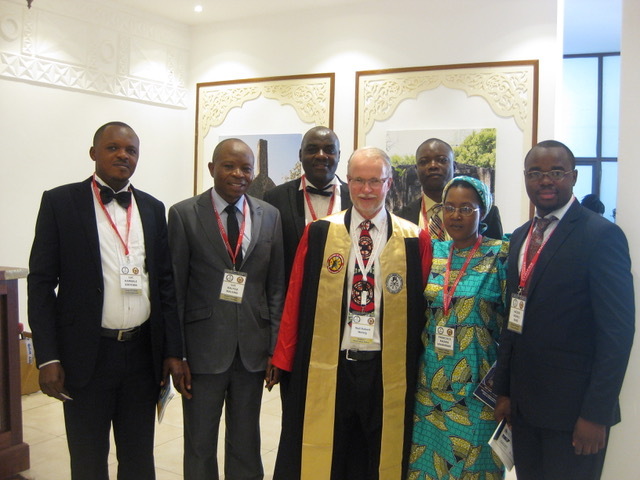 Dr Kinyoma (Trainee); Dr Luc (Director of COSECSA, HAH), Dr Kahuko (Trainee), Dr Neil (awarded a COSECSA Fellowship ‘by election’) and Trainees Drs Severin, Francisca and Jacques. 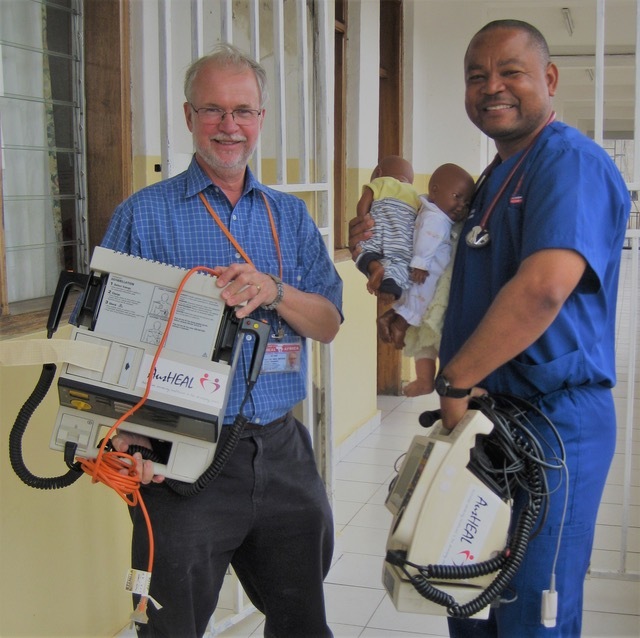 Dr Neil and Dr Muller with defibrillators for the Emergency Department – thanks to the MATER HOSPITAL in BRISBANE Australia who sent over a container of equipment. Congratulations to Dr Muller on his Graduation in Emergency Medicine in Dar es Salaam in early December. Neil attended the G4 meeting in Washington DC on 10-11 November. The G4 Alliance for Global Surgery, Obstetrics, Trauma and Anaesthesia care is seeking a way ahead to provide access to safe, affordable surgical and anaesthesia care for 5 billion people worldwide who do not have such access. He was representing HEAL Africa Hospital. Of the 83 organisations represented at the conference, only 12 were from Low and Middle Income Countries – therefore the importance of being there as a voice for the truly neglected surgical patient, as well as for HAH and its work. Neil had opportunity not only to highlight HEAL Africa Hospital but also stress to those present the need to include more representation from LMICs. It was an interesting time to be in Washington so soon after the Presidential election and to be briefed about the potential impact that will have on US relationships with the rest of the world. On a previous trip, we (Neil & Gwen Wetzig) kept acknowledging a female security guard at the hospital gate – but, there was not much response. We kept smiling every day and said “Bonjour”. Slowly there was a little response. On this trip there has been a great response – hellos and smiles and even calling each other by name. To top it all off – her son was a patient at the hospital. – Now there is a very happy security guard who smiles and greets us enthusiastically! For a few weeks we greeted a young disabled girl with hydrocephalus (maybe aged 10-11 years) who just sat on some steps as we walked past every day. We would greet her but there was no response. We kept saying “Jambo” and waving and smiling. Gradually, after many days she began responding. Then she began waiting for us. Then she initiated the waves and smiles and called “Jambo” out to us. Then one day, she was gone! We just hope that for those few weeks we were able to bring some small amount of joy to her days. One day we found a young boy in a wheelchair sitting in the doorway of a room at the bottom of the steps we use to go up to the AusHEAL office. His leg was pinned and in plaster. He was perhaps about 8 or 9 years old. The first day we said hello and smiled, but there was no response – then again the next day but still no response – then a few days later a little acknowledgment – then half a smile – then a “jambo” response! By the time we left there were big smiles and ‘jambos’ and ‘bonjours’ every day and a very warm and hearty response from him every time we passed. One day he was crying and Gwen stopped beside his wheelchair. What could she do????? Nothing much – so she prayed… and touched him on the shoulder and continued on. When she returned about 15 mins later, he was happy again and smiled brightly! Gwen also had the opportunity when seeing him wheeling himself out of the outpatients building, to offer to push his wheelchair back to his room. He agreed – what a precious moment in time. One day there was a young girl walking through the hospital wearing a T-shirt that said “Use your Smile to Change the World.” No one of us can change the whole world – but we CAN change someone’s world…. sometimes!! !